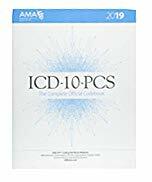 ICD-10-PCS 2019: The Complete Official Codebook contains the complete ICD-10-PCS code set and supplementary appendixes required for reporting inpatient procedures. This illustrated codebook presents the code set in 17 sections of tables arranged by general procedure type. Tables within the extensive Medical and Surgical section are additionally sectioned out by body system, indicated by color-coded page borders. ICD-10-PCS contains classifications for procedures, devices and technologies.